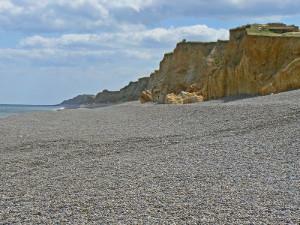 Weybourne beach01263 513811work BeachThere are large pebbles on the beach and the coastline to the west is flat with views extending to Blakeney Point, to the east cliffs begin to rise which extends all the way to Happisburgh. In the village there is a pub and hotel together with a corner shop. There are miles of footpaths and bridleways in the surrounding area of Kelling, Kelling Heath and Muckleburgh Hill and areas of outstanding natural beauty with magnificent views. Along the coast road (A149) is the village church, dating from the 15th century with its old Saxon tower. Within the grounds of the church is a ruin of an Augustine Priory. Half a mile above the village is the North Norfolk Railway station and goods yard. The station has a workshop and is home to various railway vehicles. Steam trains regularly pull into the station offering a ride on the “poppy line” into Holt in one direction or Sheringham in the other. •	The beach is accessed via Beach Lane. •	The beach is made up of pebbles and is quite mobile due to the action of tides, wind and currents. •	There are no RNLI Lifeguards on this beach. •	Please clean up after your dog. •	There is a large promenade with working fishing boats on it. There are large pebbles on the beach and the coastline to the west is flat with views extending to Blakeney Point, to the east cliffs begin to rise which extends all the way to Happisburgh.